N.B. If you're looking for information on how to add a Business Organisation go and read the Adding Business Organisations article. When looking to add a School Organisation, the first thing to understand is how a school in the Education Data Module differs from a school in your Organisations Module. To help with that you should head on over and read the What Are Organisations? article. Whenever you try to add a School Organisation to your Organisation module, Campus will always attempt to offer you one from the Education Data module so you can add it quickly and easily and not have to type in all the relevant details like address, phone number and school type etc. Very often that's done with just the click of a button which saves you a bunch of time and gives you the peace of mind that the data you're adding to your Organisations list is accurate and up-to-date. You should always, where possible, accept Campus's help with the school data when you're adding School Organisations. This is because when you do, Campus creates an invisible thread between your new School Organisation and the School in the Education Data module. This invisible thread is really important for you to be able to market responsibly and successfully. When you're doing your outreach marketing to the schools in the Education Data Module, Campus will recognise that some of these schools are also in your own Organisations module and allow you the option of removing them from your outreach marketing. This is a very useful feature as you should not, except for in special circumstances, send the same marketing to the schools that have shown a genuine interest in your business or those that are currently your customers (your Organisations) and those schools that have not yet subscribed to you (schools in the Education Data module). Head on over to the Add an Organisation page which is here: Contacts and Organisations -> Organisations -> Add an Organisation. i) Specify that your Organisation is a school (not a business). ii) Start by simply typing the school's name, or the address, or email address, and Campus will scan it's 30k+ educational establishment database and offer you a match, or several matches, for you to choose from. If the school you need is there simply click on it and Campus will give you some more detail about the school and ask you to confirm if it got the right one for you. You can review the address, telephone number and the school address to double check and if it's correct click the Save button. If it's not then click on the OK, try again button. iii) Under some very rare circumstances you might find that the school you want to add as an Organisation doesn't exist in Campus's database of schools. 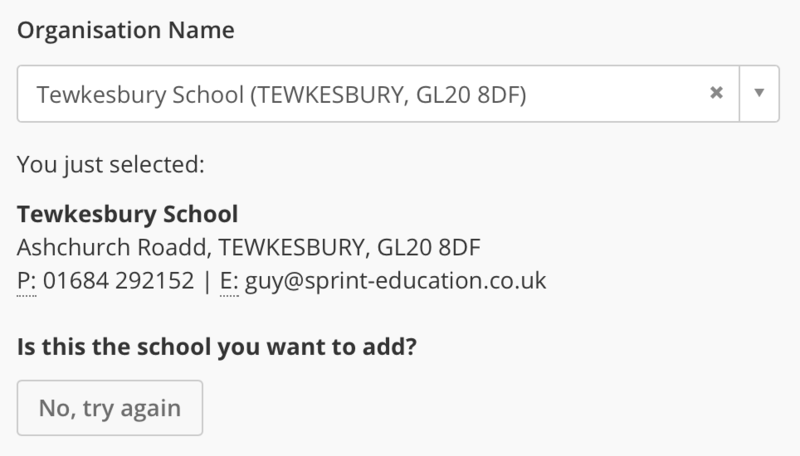 If this is the case you can click on the + Add a new school button (at the bottom of the dropdown) and fill in your own details in the form that appears. N.B. Adding a brand new school, rather than converting one from the Education Data module should be your last resort. (Always check you're spelling it correctly when adding it). If you do decide to manually add a brand new school Campus won't be able to create a invisible thread meaning you could end up sending outreach and inbound marketing to the same school. which actually already exists in the Education Data module, it's correct name being: 'Bath House Primary Academy School'. Next let's say you send a 10% discount inbound marketing email to all the contacts at your Organisations. Bath House Primary Academy School will receive that. Then let's say the next week you send a 20% discount outreach marketing email to all schools in Somerset… whilst also ensuring that your current Organisations don't receive this offer – you can see the problem that arises – Bath House Primary Academy will receive both pieces of marketing because there is no way for Campus to recognise that your Bath House is actually Bath-House – there was no invisible thread between the two created when you added it manually. Within Campus you'll find a bunch of Add to My Organisations buttons on different pages which you can simply click to add a School to your Organisations. For example, the View a School Page. You can find that by clicking on Education Data in the main menu and then selecting Search. Start typing the school's name and then click on it. You'll whizz over to the View School page where you'll find an Add to My Organisations button. Simply click it and that school will be added as an Organisation.